Quite by accident, a Smithsonian researcher has uncovered the remains of what appears to be an early Cretaceous-era flowering plant. The remarkable fossil was originally uncovered back in 1971, and it may be the oldest example of its kind from North America. Flowering plants first emerged from now-extinct plants related to conifers, ginkos, cycads, and seed ferns. Paleontologists used to think that they first appeared about 140 million years ago, but a recent discovery in Europe shows they've probably been around since the Early Triassic, about 252 to 247 million years ago. As for the fossil found in the Smithsonian Natural History Museum's collection, it dates back only about 115 to 125 million years — but it may in fact be the oldest specimen found in North America. The fossil was discovered by University of Maryland PhD student Nathan Jud while checking out a batch of ancient plant fossils stored at the Smithsonian. On closer examination, what he thought was a piece of fern turned out to be a two leaves connected to each other. The leaves featured a closed network of veins and tips containing glandular teeth used to shed excess water — characteristics indicative of flowering plants. Flowering plants—which replicate with sexual structures (i.e. flowers) to produce seeds—now dominate the planet, but for the first 300 million years or so of plant existence, beginning around 450 million years ago, the only types of vegetation belonged to older, more primitive families, such as algae, mosses and ferns, which all reproduce with spores, rather than seeds. During the Early Cretaceous, some of the first primitive flowering plants began to evolve. Researchers know that the layer in which this new fossil was found dates to this time period due to a few factors: Pollen analysis (which considers the chemical makeup of pollen embedded in the surrounding rock) and fossil benchmarking (which looks at the other fossils trapped in the layer as chronological context). 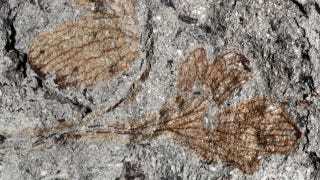 The same layer has previously produced several other flowering plant fossils of a similar age—together, they're the oldest ever discovered in North America—but this is the oldest example of a eudicot, a group that includes roughly 70 percent of flowering plants worldwide today that share a distinctively-shaped pollen structure. Compared to the other fossils found in the same layer, this one is especially remarkable for its derived traits, anatomical characteristics that were previously thought to have developed much more recently in flowers. Their existence so long ago suggests that some early plants were actually quite complex. Read the entire account of the discovery at Smithsonian's Surprising Science. And check out the entire study at The American Journal of Botany.